According to the International Energy Agency in an article featured on Bloomberg, solar energy could account for the majority of the world’s power by 2060. The IEA bases their projections on the rising feasibility of solar power implementation around the world, as technology improves and prices decrease. In fact, as the world increasingly moves away from fossil fuels, the IEA sees a big role for renewable energy in the future. Photovoltaic and concentrating solar plants could meet most of the world’s demand for electricity in 2060, accounting for about half of all energy needs worldwide. Although the IEA’s statement specifically focuses on solar power, they also see a strong role for other renewables such as wind, biomass, and hydropower. The findings, which are to be published in an upcoming report later in 2011, are an optimistic step forward since the agency’s last projections. It had previously predicted that solar energy would only account for 23% of global power needs in 2050. But recent advancements in solar technology and pricing have forced the IEA to adjust their projections. But some would even say that solar power may be coming even sooner than the IEA has predicted. Esteemed futurist Ray Kurzweil argues that the exponential increases in solar power technology will continue over the next few decades. He claims that the world could be deriving 100% percent of its energy needs from solar power by 2031. While achieving 100% renewable energy by 2031 is an ambitious proposition, recent advancements made in the solar energy sector give reason to be optimistic. Not only are prices expected to compete with coal in the very near future, but some serious technological advacenemnts are currently in the works. 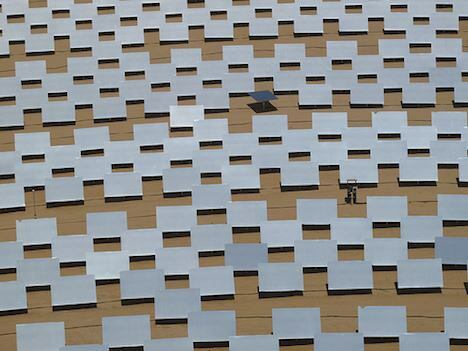 Take the recently constructed Gemasolar power plant in Spain, for instance. Located in the Spanish province of Andalucia, the Gemasolar concentrating solar power plant is the world’s first 24/7 Baseload solar power plant. If advancements continue at the rate they have been going so far, then the IEA’s predictions may well be on track. Image CC licensed by Steve Jurvetson: solar thermal power plant.